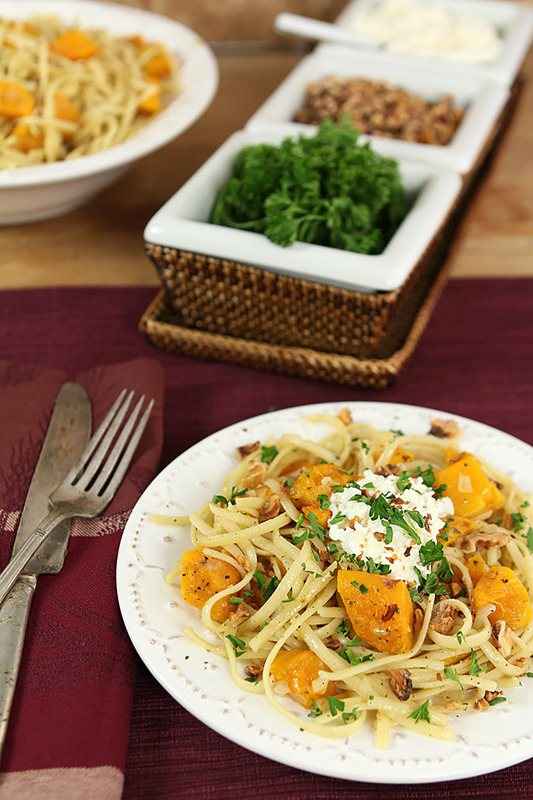 Roasting brings out such great flavor in vegetables and makes this Roasted Butternut Squash Pasta with Ricotta and Toasted Walnuts extra special. A few weeks ago I had the pleasure of participating in a luncheon at The Seasoned Chef Cooking School in Denver that was hosted by the folks who own Epicurean Butter; another local Denver company. 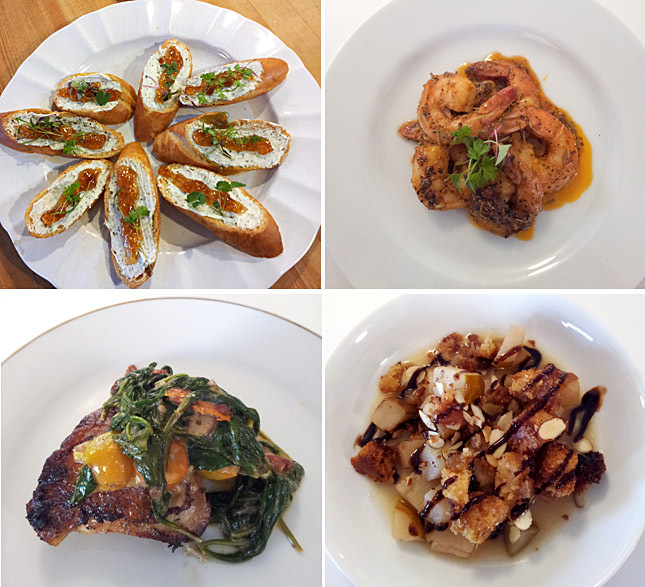 Epicurean had brought in Chef Julius Russell to prepare several dishes using their product to introduce it to local food writers, bloggers, and other food industry professionals. Epicurean Butters are a line of compound butters that are infused with flavors from sweet to savory that have been developed by John Hubschman, a Denver chef whose vision was to bring to the home cook a gourmet quality product more often associated with restaurant dinners. There are 14 different flavors of Epicurean Butter and I was lucky enough to get to sample almost all of them. It should come as no surprise that I loved the Caramel Sea Salt Butter where only a spoon is required (OK maybe a biscuit would be nice too!) 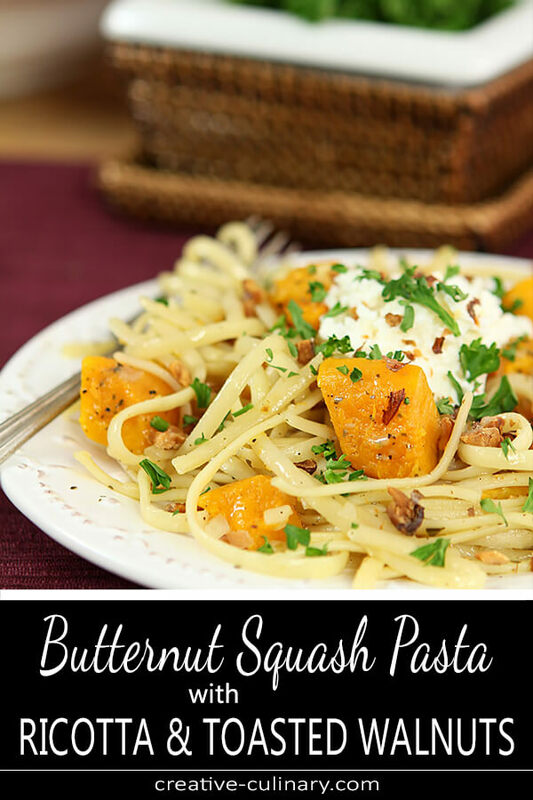 but I’ve loved using several of them in the past couple of weeks and have used them for pizza, dessert and this AMAZING Butternut Squash Pasta. For our luncheon, we were treated with several dishes to sample; all using a different flavor of Epicurean butter. Chef Julius and his assistant prepared apricot and goat cheese bruschetta, sauteed shrimp in Scampi Butter, a roasted pork loin and my favorite, the ending to our meal, a buttery apple bread pudding to die for. I still need to get that recipe and share it with you! This was a fun event; I saw some old friends, reconnected with one of the judges that I shared duties with at the National Beef Cook-Off and enjoyed a fabulous tasting while taking a break from work. Tough job huh? I had actually planned to re-create one of Chef Julius’ recipes until I spied this one in the gift bag that was given to all participants. 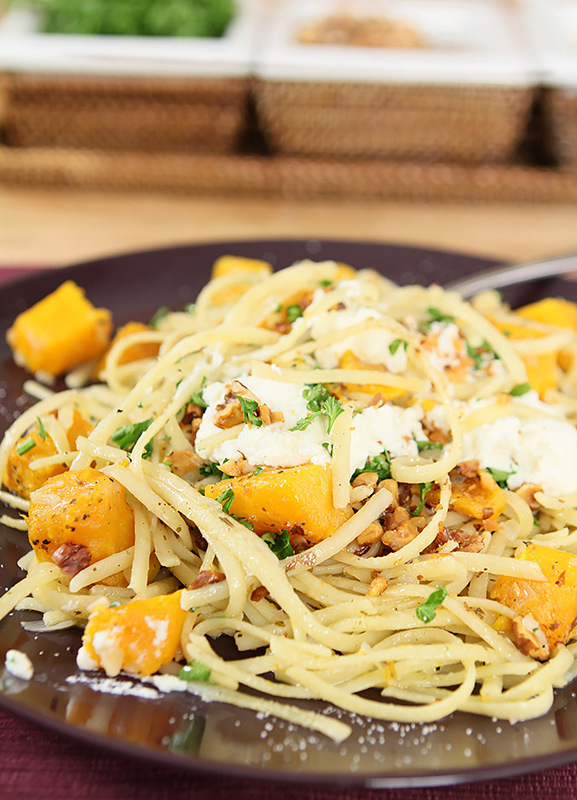 Everything about this sounded wonderful from the roasted squash to the ricotta topping with toasted walnuts. I took it across the street to neighbors for dinner. Their daughter Lena has become quite my little pal but she still resisted something new. I begged her to try it and even did the ‘airplane’ with her fork. Looks like she was swayed huh? During this short lull between Thanksgiving and Christmas when you want something satisfying for your family or friends, give this dish a try with the help of an Epicurean Butter; you’ll love it! Heat large pot on medium high heat. Add butter and shallots. Cook till shallots are clear. Add pasta water and cook for 5 mins. Add pasta and squash and gently combine. Season with salt and pepper. Scoop large spoonful into serving bowls and top with ricotta, toasted walnuts, parsley and a sprinkling of finishing salt. Great as a side dish or the main course! Epicurean Butter is found at stores all over the US; they are in most Whole Foods and Sprouts locations. I received samples of this butter from Epicurean Butter but all commentary is my own. The perfect comfort food!omgosh, this has to be what’s for dinner tomorrow night. tell me this, can i make it without the Salt & pepper? food allergy. Sure, you can leave out those seasonings; it will be blander but there is so much flavor from the other components it will still be great. Ummm…YUMMMMMMMM is super simple to make your own pasta! I’m not sure why I don’t do it more often…I have one too but mines not as pretty, although its my fav! You get to go to the best events! The food looks great and I love this pasta dish. 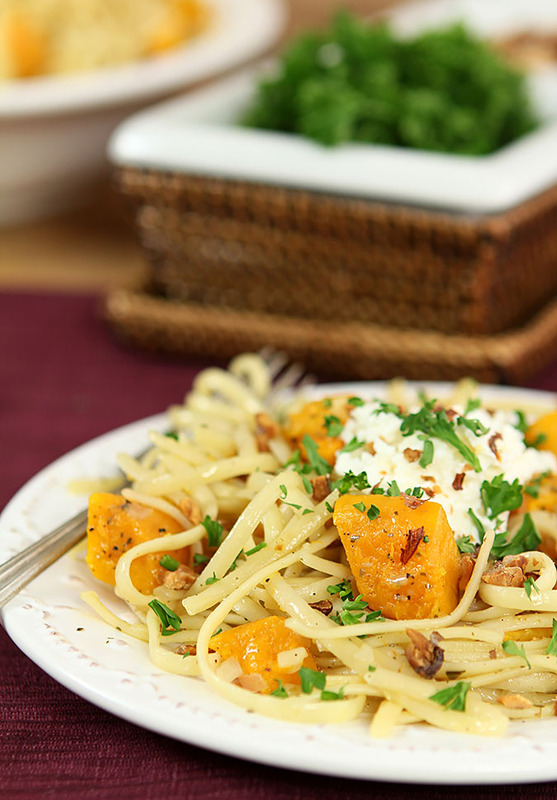 I am a nut for roasted squash or pumpkin and LOVE ricotta on pasta dishes. Gotta make this one; just really a beautiful light but tasty meal.The herb butter sounds amazing. And to purchase the compound butter ready made? Yes, please! Barbara, your photography is outstanding… and what fun the cooking school must have been. I miss the days of the cooking school I co-owned! Lovely recipe. And such a cutie! You’ve taken a beautiful photo. The pasta looks and sounds delicious. I do love them! And hope to re-create this recipe soon. So many butters to try! 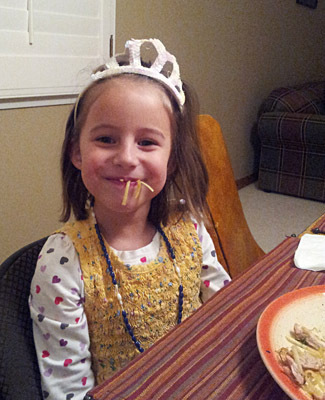 Looks like little Lena enjoyed the pasta! How cute. The Savory Line of Epicurean Butter sounds lovely and their Sweet Line sounds delicious! I really love compound butters! I usually make my own and freeze them, so I can have some whenever I want. I can imagine how great they’d be in a dish like this! Really nice, healthy, seasonal dish — all the hot buttons everyone is looking for! Good stuff! Thanks. This sounds great and by the looks of it, was a real hit with foodies of all ages! One of my favorite dishes is a butternut squash ravioli that I’ve only ordered while dining out. Making ravioli at home sounds labor-intensive but this pasta dish I could manage. Does Whole Foods sell the butters? I’ll look next time I am there. Be sure to enter my Whole Foods giveaway this week–who couldn’t use an extra $50 to spend at Whole Foods this month? What a wonderful day! I am intrigued by these butters. I’ll have to stop by my neighborhood Whole Foods and pick some up. Thanks for the introduction! What a great day of food tasting. I just loved that shrimp. That apple dessert was wonderful too. I didn’t get any of the salted caramel. I guess I’m going to have to chase some down. Now, as for this pasta, I have all the ingredients so I guess I know what we’re having for dinner. Oops I did it again! Yes; reserved pasta water; I’ve added 1/2 cup to the recipe ingredients list; thanks for spotting that Marianne. It is SO good; just one of those magical moments when simple ingredients come together to make fabulous!